Miniature. Tempera and liquid gold on vellum. Penitent King David and young David’s victorious fights against a lion and a bear. Full-page miniature on vellum, illuminated in the workshop of Simon Bening. This miniature leaf comes from a Book of Hours and originally would have opened the Penitential Psalms. It portrays King David in Penitence kneeling inside an entrance hall, his harp lying on a bench, with a Flemish town scene in the background. This scene is surrounded by a full border showing in a landscape two episodes from the young David's life: David fighting a lion and fighting a bear. Marginal scenes are included quite frequently in borders of the Ghent-Bruges School. At the end of the 15th century, Flemish artists experimented with and transformed the appearance of the illustrated page, introducing innovations of texture and space. 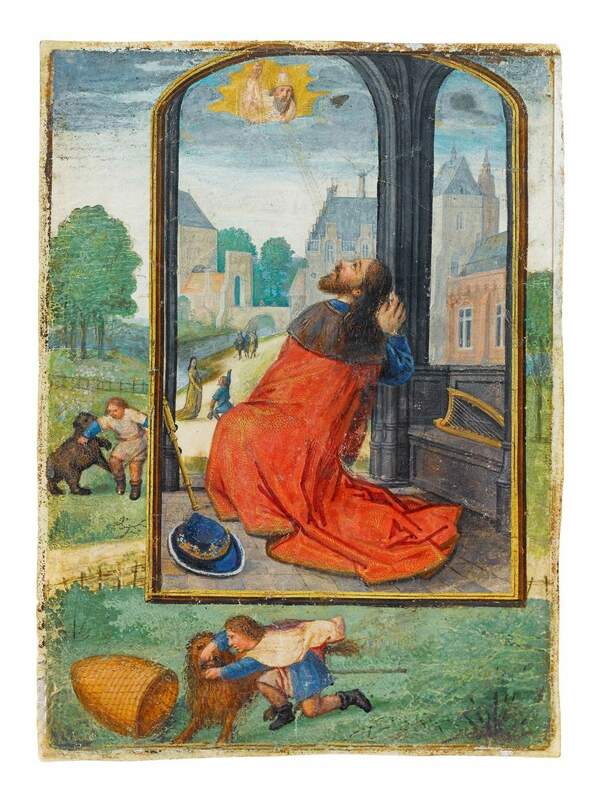 The present miniature can be attributed to the workshop of Simon Bening, one of the most celebrated illuminators of Flanders. Presenting a picture within a picture and modelling in three-dimensional frames was a technique Bening refined and perfected to the highest standard. The painter also shows an intense interest in landscape and details of nature. His fame was widespread and his oeuvre has been desired across Europe by those possessing the taste (and means) to acquire the most remarkable illuminated leaves available.